When I teach people how to improve their folding, there is one lesson I try to drive home above all others: Slow Down. Today’s world is all about efficiency and expediency. People are much more often encouraged to get things done than to get things right. To be fair, this mindset is often justified. There are plenty of fields where nitpicking over minor details is much less productive than making sure the core elements are more or less in order. While a clean, freshly polished car with no scratches or dents is certainly nice, a messy car will still function as long as it has a functioning motor, drive shaft, and so forth. There is effectively a divide between the form and the function. In origami, this divide is much less distinct – if it exists at all. Due to the inherently geometric nature of the art, the precision is not just what makes a piece look clean and presentable – it is what makes the piece possible in the first place. It is true that there is often detail work to be done in the final steps of some models which is more or less independent of the other details going on around it. Once the four legs of a horse have been formed, the work done on one hoof generally will not impact the work done on another foot. So two identically folded bases can still end up looking very different depending on the skill of the artist shaping those final details. There are also origami designs which rely much less on concrete reference points from the outset. But while those pieces can still be very beautiful in their own right, virtually every piece will ask for some exact reference points, and the more technically advanced the piece is the more exact reference points it will require. You can think of it like a geometric proof. For something simple, like Euclid’s proposition one of book one, which constructs an equilateral triangle out of two circles, a general approximation will suffice as a demonstration. One doesn’t need to draw perfect circles to convey the logic behind the proof. But the more complex the premise, the more precise one needs to be if a visual representation is to avoid becoming an incoherent mess. Though I’m not aware if it was ever a conscious decision in the history of the art, in my mind this call for objective reference points and precision is the reason why the square has become the default shape for pieces to start from. Every square has four lines of symmetry – four lines which can always be determined exactly by a hypothetical perfect artist with a hypothetical perfect sheet. Every regular polygon has as many lines of symmetry as it has sides – triangles have three, octagons have eight, etcetera. But squares have a further advantage – they are the easiest shape to construct from any given sheet of paper. For any flat, planar sheet of paper, every crease that results in a sheet that can be pressed flat against a flat surface will be a perfect line. (As an interesting side note, there are ways to fold ‘straight’ lines that can’t be pressed flat, which is often used to round out a piece and make it look more organic. But when considered mathematically, this process has some very fascinating implications. For more information, check out Margaret Wertheim’s TED Talk on the mathematics of coral here – particularly with the setup around 6:30 and the payoff at around 9:45.) And one of the simplest things to do in origami is to construct a perpendicular to a straight line – simply align a straight edge along itself and you’re effectively bisecting a 180 degree angle. If you line up two points on that edge in the process that perpendicular will also be the midpoint of those two points. So if you fold any flat sheet of paper, regardless of the starting shape, you can get a straight line. Then by aligning that line with itself you can get a 90 degree angle, and construct a perpendicular to that angle to get three sides of your square – two parallel lines and a perpendicular. Finally, by bisecting one of the two 90 degree angles (through aligning the two edges which meet at said angle), we end up with an isosceles right triangle. We can either find the mirrored triangle and connect the heights to get our fourth side, or we can match the third edge after aligning the first two, or we can just align our two parallel lines starting from the height of the triangle. This is the simplest regular polygon, but far from the only one able to be constructed from folding. It is entirely possible to construct equilateral triangles, pentagons, hexagons, heptagons, octagons, and nonagons, – as well as any polygon with two, three, or five times as many sides as any otherwise constructable polygon (thus opening the door for four times more, six times more, nine times more, and others, through multiple divisions into two three or five). I got my answer when I decided to do the Thousand Cranes Challenge. As you may or may not know, there is an old Japanese story which says that anyone who folds one thousand origami cranes will get a wish. Though the story most likely originated some time in the late 1700’s, it got international attention through a young woman named Sadako Sasaki, who was exposed to radiation at age two from the attacks on Hiroshima and folded over one thousand cranes when hospitalized for leukemia. She died at only twelve years old. The story was well known enough that I had the idea to fold the thousand cranes for as long as I could remember. While I was in the hospital after my spinal cord injury my friends came together and made a thousand cranes which they gave me as a gift. But when I finally started in mid/late July of 2011, shortly after my 25th birthday, I decided that I would add my own personal twist to the tradition. 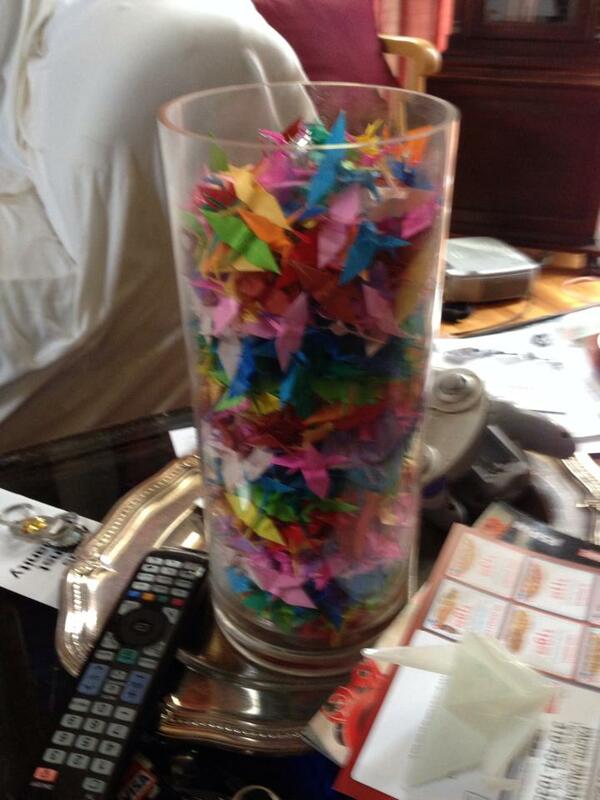 I would fold the thousand cranes, but I would limit myself to one per day. To be fair, I didn’t do perfectly. There were some days I missed, and even a few where I didn’t remember if I had folded that day’s crane or not. I always made up for lost ones as soon as possible, though. And most importantly, I always made sure that every fold on every crane was perfect. Perfection is a funny thing, though. The difference between a novice and a master is that the master knows when to create intentional imperfections for the sake of the greater perfection. Like an author who intentionally contradicts standard punctuation conventions in order to create a specific effect, a master of origami must know when to make edges NOT line up. 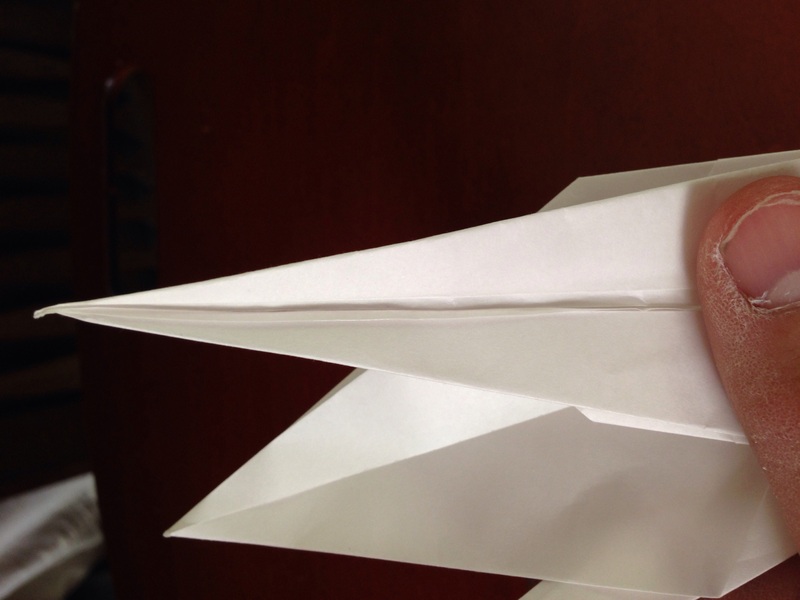 In more advanced models the effect compounds upon itself, but even in the relatively simple crane the concept comes into play: Despite how we talk about it, paper isn’t two dimensional. It does have depth, even if it is significantly smaller than the other two dimensions. And this minor depth – the thickness of the paper – grows exponentially as layers build up in the model. 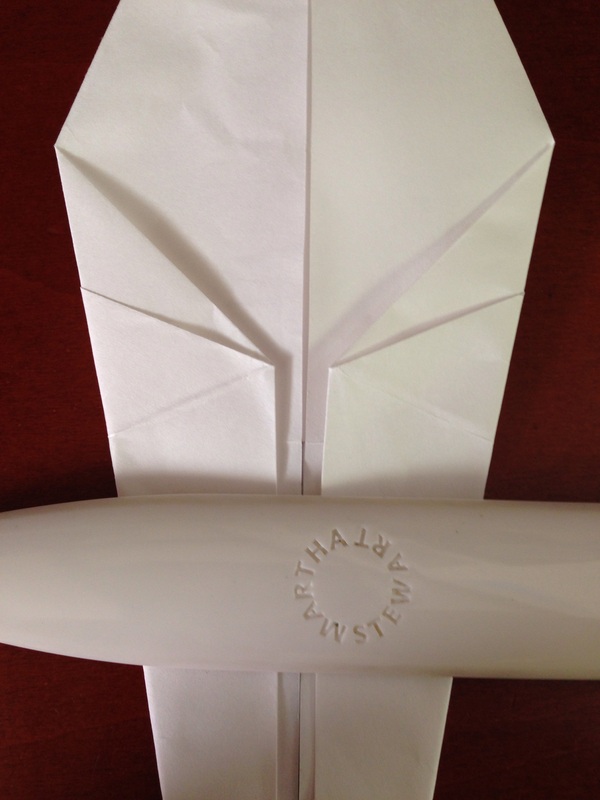 You may have heard the old story that it’s impossible to fold a sheet of paper in half ten times. If you’ve ever actually tried it, you’ll know it gets virtually impossible well before the tenth doubling. Generally this issue is battled by finding especially thin papers for pieces that have a particularly high layer density. But even that trick has its limits, and even i it didn’t, there are times when it can be nice to use thicker papers (as I mention as I detail creating the paper for my original Deku Mask design). So, what do you do then? Well, the most common answer may sound like blasphemy at first: Intentionally miss the reference points. Inconceivable, I know, but hear me out. With certain arrangements of layers, one can help minimize the issue of bulk by allowing for extra room for those layers to fit into. 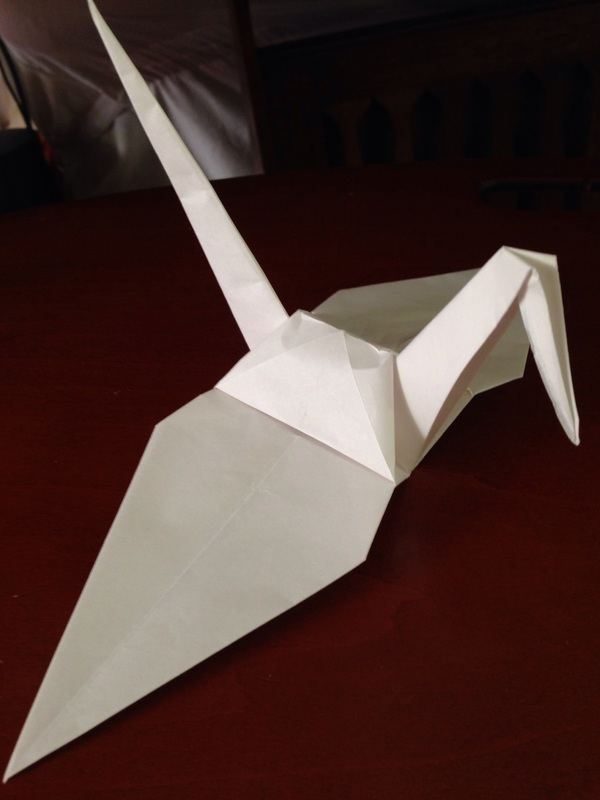 To use the example of the crane, one of the last steps has you inside-reverse fold the tail and the head upwards. If you’re doing the more ornate, inflatable version (as opposed to the flapping variant,) you must thin the appendages before reverse folding them. Here I have a picture of a crane in progress, and as you can see I intentionally left a gap between the folded edge and the midline. Thus, once I actually make the reverse fold, the outermost layers have a buffer area to help cover the combined thickness of the inner layers. Personally, I find this evolution as an artist to be rather poetic. One starts off unwieldy and unrefined. Then through practice and discipline one learns precision and accuracy. Only after passing through both of those stages is one ready to finally combine the two into an even greater perfection. Thesis, antithesis, synthesis. In the time between July of 2011 and April of 2014, I had one thousand opportunities to work on my perfect imperfection. 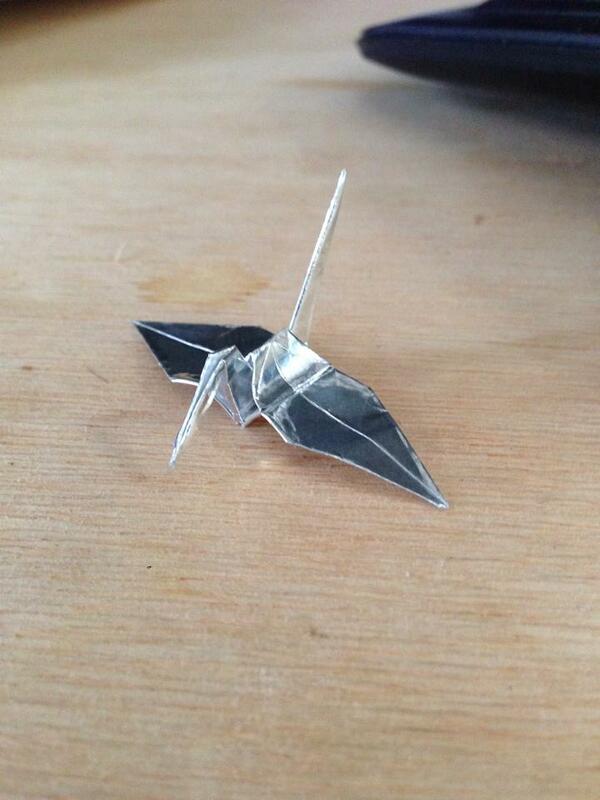 And after over two and a half years, I finally folded what may be my most perfect crane ever. This is a fantastic piece on patience, perseverance, precision, and art. A very valuable read from my colleague Travis Taft.